NEW! Choose a unique color, and we'll create a custom PMS-matched poly front cover. Your color choices are unlimited! 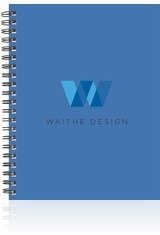 The perfect solution for strict branding guidelines and hard-to-find colors. Available in 4 convenient sizes, and includes a 1-color foil imprint up to 16" sq. *Note - Metallic PMS colors are not available on this product. Call for higher quantities. Setup fee of $125 G. Price includes 1-color foil imprint up to 16” sq. and a full-bleed 1-color screen print on the backside of Natural Poly front cover. Standard turnaround 7-10 business days. Actual pre-production sample available for $150 G.